Display plants in style on the deck, patio, or in the house with this lovely six-tier plant stand. Each plant stand features a sturdy metal design with a stylish bronze paint finish. Plus, this piece is foldable so storing them when not in use is a breeze. Overall dimensions: 23 inches wide x 19 inches deep x 44 inches tall; weighs 8 pounds. Each tier has a 13-lb. weight limit and a 9-inch inside diameter x 2.5 inches deep so it can fit planters with up to a 9-inch diameter bottom. Made from durable metal finished with a bronze paint for a classy and elegant look. 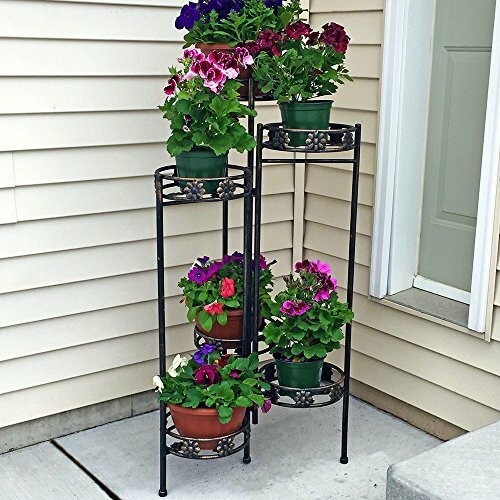 Each package includes one metal six-tier plant stand so you can place six plants in a staggered style. Support can fold up for easy storage when not in use. Folded dimensions: 12 inches wide x 11 inches deep x 44 inches tall.